I read this article and found it very interesting, thought it might be something for you. The article is called Revealed: Docklands Revival, Mumbai’s Last Chance and is located at https://archive.indiaspend.com/cover-story/revealed-docklands-revival-mumbais-last-chance-28156. For more than a half a century now, the forbidding ramparts of the Mumbai Port Trust have marked the mysterious, south-eastern boundary of India’s crumbling, financial megapolis. The stately, colonial-era buildings of Ballard Estate, the slithering metal of old rail tracks on freshly resurfaced roads, and the peaked roofs of warehouses in endless rows, barely suggest the grandeur of Bombay Harbour, India’s erstwhile premier world port. Walled off from its grand, old port, Mumbai remains oblivious to the gateway’s pivotal role in the city’s and India’s 20th-century economy. Interest in the world beyond the ramparts surged recently when the roving eye of the real-estate industry, nearly exhausted of options in one of the world’s most congested cities, rested its gaze here. For more than a decade, a proposal to reclaim the 142-year-old port from traditional use has recurrently reared and withdrawn its head. The Port Trust — landlord of the docklands, Mumbai’s richest land bank — is famous for clenching its fists at the mere thought of yielding the land for other uses. Now, with a new government at the helm and new hopes pinned on a larger revival of a now-ramshackled city, there is yet another prodding at the gates. A knock, perhaps emboldened by the recent unveiling of an elevated Eastern Freeway, which, for those who use it for a speedy exit from Mumbai, offers the first unfettered view of the hidden eastern seaboard–and its possibilities. Note: The images might take a minute or two to load in your browser. Collectively, Port Trust land sprawls across 752.24 hectares or roughly one-eighth the size of the island city, Mumbai’s southern core, once the limits of the old city of Bombay. Most of the docklands unfold along a 14-km waterfront, laced with road and rail. This is still India’s largest multi-purpose major port, capable of handling a variety of shipping, from bulk liquids to container goods. Yet today, it handles merely 10 per cent of the nation’s sea-borne trade. The movement of industrial activity outside city limits about three decades ago, and the launch of the Jawaharlal Nehru Port in 1989, across a bay from Mumbai Port, deteriorated port-city relations and exacerbated the Port’s decay. A historical analysis of the harbor, A Study on the Eastern Water Front of Mumbai, by the Urban Design Research Institute (UDRI) and Kamla Raheja Vidyanidhi Institute of Architecture (KRVIA), reasons that this decline is a sign of the city’s progression into a post-industrial phase. “Land use is now largely limited to port operational areas, cargo storehouses and large manufacturing units, which are unrelated to the city’s activities,” the 2005 report said. Mumbai, fully absorbed in its role as India’s financial capital, has focused on commercial and service activity since, complemented by a real-estate industry on steroids. 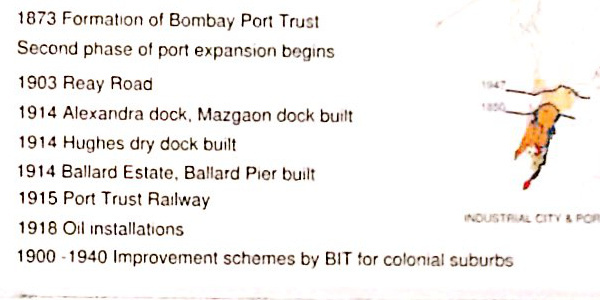 Timeline of Mumbai Port development: Click the image above to see the full version. So, Union Minister of Shipping Nitin Gadkari’s announcement of the Centre’s intention to free up the waterfront for expanding Mumbai’s choking confines was enthusiastically received, albeit with some trepidation. If the docklands are opened up, it won’t be Mumbai’s first tryst with reinvention. The last attempt was not a happy experience. In 1990, freeing the defunct textile mill lands (roughly 600 acres in the heart of south-central Mumbai) offered Mumbai its first opportunity at unified urban planning and reinvention. Cities across the world recreate themselves, and this was the first, great opportunity for an Indian city. The Mumbai Metropolitan Region Development Authority (MMRDA) under celebrated architect Charles Correa, drew up a detailed proposal, dividing the land equally into three parts for public housing, open spaces and commercial activity. However, with little political will, the plan succumbed to private interests and the city instead went into another unregulated construction blender. Most of the land was either retained by mill owners or parcelled out to developers for commercial interests. More than 250,000 mill workers were displaced from their source of livelihood and housing. For its second opportunity, the government has set up the Mumbai Port Lands Development Committee (MPLDC) to frame a waterfront regeneration proposal that can lift Mumbai’s declining quality of life. Former Port Trust chairperson, Rani Jadhav, leads a team of urban-planning experts, and a plan has been submitted to the shipping minister, after surveying the area and assessing the needs and demands of stakeholders. IndiaSpend accessed this report, yet to made public, that maps out 721.24 hectares of Port Trust land for revitalisation. Informal settlements, storage and manufacturing sheds occupy most of it; the Trust’s other plots across the city (Titwala, Kalyan, Thal Knob and the chairman’s bungalow in tony Altamount Road), have been excluded. After the mill-lands plan crumbled, the port-trust plan offers India’s financial capital its last, great chance of offering its citizens open spaces to live, work and play. The plan–integrated with Mumbai’s upcoming 2014-2034 Development Plan–proposes the eastern seaboard be revitalised on the values of what it calls “intelligent urbanism”, the catchwords being open, green and connected. ‘Open’ for new public uses, such as recreation, culture, tourism and community amenities. ‘Connected’ through multiple transportation modes: walkways, cycle tracks, metro, ferries and bus rapid transit. ‘Green’, to ensure environmentally sustainable land use. The plan calls for 30% of docklands to be set aside for open spaces, another 30% for transport and infrastructure and 40% for mixed-use development for businesses, the fishing industry, office and retail markets and a finance centre. According to a member of the Rani Jadhav committee, if all goes according to plan, the open space per capita ratio for Mumbai will nearly triple from the present 0.99 square metre per person. “We have planned for 300 acres of pure open spaces…we expect the open-space ratio to rise to 3 square metre per person — the equivalent to adding 13 more Oval maidans (a sprawling, green 22-acre lung in Mumbai’s downtown heart),” the member said, on condition of anonymity. The proposal has also made provisions for promoting tourism in the area, with the construction of a London Eye-like observatory wheel, a floating hotel of 500 rooms, a luxury cruise terminal, a marina, or an underwater aquarium. The plan proposes a public-private partnership (PPP), with the state and central governments raising the initial corpus of Rs 1,000 crore. “There has to be considerable public funding in infrastructure development to avoid mismanagement of public goods. We don’t want to face the controversies plaguing PPP projects such as the metro,” the member said. The MPLDC has also planned to preserve the flamingo-flecked Sewri Mudflats of the eastern seaboard and various, colonial-era heritage structures, such as the Gadiyal Godi clocktower, Ballard Estate (Mumbai’s first business district, built in the late 19th century), Sewri fort and other industrial heritage structures. London. New York. Toronto, Sydney. Singapore. Barcelona. The list of cities across the world that have rejuvenated dying docklands is long. The process started in the 1960s, as global commerce and shipping boomed and outgrew ports nestled within cities. As sprawling, new ports were constructed, old docklands fell into disuse. In devising its plan, the MPLDC has instead looked east at the ‘smart city’ examples of Hong Kong, Singapore, Kuala Lumpur and (to some extent) Australia, where digital technologies are used to increase efficiency and reduce costs and resource use. Mumbai has a density of 270 persons per hectare, as against 106 of New York, 83 of Singapore and 64 of Hong Kong. The member pointed out that Mumbai has mainly grown along two railway lines, forking out from its southern extremity, near the docks. While the city’s first Regional Plan of 1973 envisaged the creation of the planned city of Navi (New) Mumbai as a remedy for Mumbai’s growing congestion, faster unplanned growth has been recorded instead along the railway corridors of Vasai-Virar, Mira-Bhayandar, Kalyan, etc. So, the docklands plan could not have come at a better time. Yet, it is but a plan. There are significant hurdles ahead. Repossession of land let out by the Port Trust is the biggest challenge facing the grand docklands-rejuvenation plan. Other than a few small parcels of unencumbered land, authorised tenancies with leases ranging from 15 months to 99 years, unauthorised (sub-let) tenancies, central agencies and corporations occupy bulk of the land available. Some of the lessees are: the Bombay Yacht Club, Radio Club, Tata group’s Taj Mahal Palace and Tower, Hindustan Unilever, and the Reliance group (Anil Ambani). None of these are going to be moved out in a hurry, easily–or at all. Barely 3 per cent of land, sprinkled in bits, is unoccupied and available for immediate regeneration. The report states that many of the leaseholders have breached contractual conditions and are in arrears of payments. As the plans gain traction, there is a palpable rise in fear and suspicion among the workers and residents of the area. The union is now demanding that port operations be maintained at three docks (Prince’s Dock, Victoria Dock and Indira Dock) and 250 acres in the waterfront-regeneration plan be allotted to house all employees and 36,000 pensioners. However the committee feels the demand for this much housing will take up a large chunk of the land, leaving little for public amenities. The Port Trust has already made considerable provisions for housing its employees (122 acres for 7,000 employees) along with the establishment of social institutions (schools/hospitals). “We have to take into account the needs and demands of 34 stakeholder groups. The unions will have to meet us halfway. We are still in conversation,” an MPLDC member said. Vishwasrao said the unions are open to compromise. “We are not against development for the public, but this is a matter of losing skilled livelihoods for the creation of marinas, floatels, and cruise terminals [that are only] affordable for the uber-rich minority,” he said. While the plan retains a much-delayed Rs 2,000-crore proposal to build an Off-shore Container Terminal, plans for reskilling those whose jobs will end are ambiguous. MPLDC members assure provisions will be made to promote businesses that employ these skills for similar “cleaner” industries. 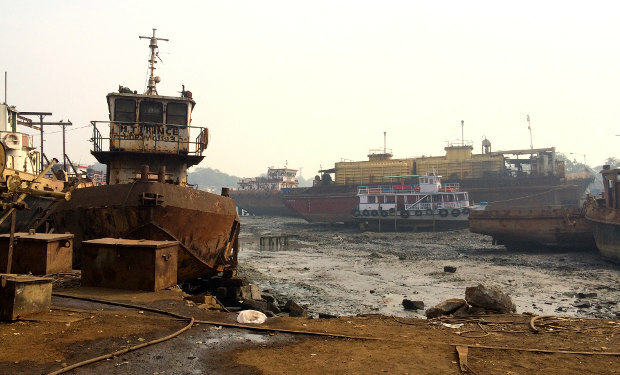 The report only pointedly states that the on-going illegal and polluting industries of shipbreaking, coal handling and rock phosphate, will be shut down. “It’s careless to say these industries must be stopped without taking into account the deep impact it will have on livelihoods and the city’s economy,” said Aravind Unni, of the NGO Hamara Shehar Vikas Niyojan (Our City’s Progress Committee), which is working at the grassroots with the affected disadvantaged parties of the docklands. While the Rani Jadhav report does not officially state the slums count here, it is estimated that roughly 14,000-16,000 unauthorised structures have mushroomed along the harbour over the years. The plan thus must rehabilitate more than 150,000 residents in the area. New development codes: Are they really possible? Coastal rules. Floor-space index (FSI). Flamingos. There are many conflicting laws and needs that will come into play once the docklands plan actually unfolds. Some are radical, such as the proposal to discard the FSI–a law that determines the extent of construction on a plot of land–a holy grail of regulation. The plan wants to replace FSI with “form-based, height-based, density-based building controls etc”, which means building permissions based on the neighbourhood. It emphasises that playgrounds, recreation grounds, water edges, walking paths and urban squares are sacrosanct and must be kept open to the public, that laws create a new urban code, so that public spaces, semi-public spaces and private properties do not develop in an “incompatible manner”. “We want well-defined development rather than see the city once again behave like a wild concrete jungle,” a member said. Once removed from its port functions, most of the land will fall under Coastal Regulatory Zones (CRZ) I and II, where no reclamation is allowed (CRZ II) or construction is disallowed (CRZ I). The committee recommends relaxing FSI, CRZ laws, among others for developing public amenities, and rehabilitating existing slums and tenancies. The increased construction, however, may significantly impact nearby eco-sensitive zones, the Sewri mudflats and mangroves. The toughest question: Is there political will? Though the committee’s proposal appears soundly grounded in the principles of public good, there is little reassurance of political will. Let’s remember that redevelopment of Mumbai’s mill lands began on a similar promise of metropolitan change. Even before the waterfront plans are off the drawing board, the Port Trust in January razed unauthorised homes on its land, serving residents less than half-a-day’s notice to move out. Port Trust Chairman R. M. Parmar said he was not aware of the rehabilitation plan in the docklands rejuvenation proposal. The Port Trust has promised that not a single square inch of its land will be sold to developers, but it has not ruled out leasing plots to private companies. “We intend to open the land for public good, but that does not mean we are restricting financial and commercial activity,” said Parmar. The docklands development proposal calls for a special planning authority, the Mumbai Port Lands Development Authority (MPLDA), an autonomous body–although the state must clear its plans–created by the central government, much like those created to redevelop Dharavi, Mumbai’s huge slum, and to redevelop the airport. The problem is such that authorities have clashed with elected urban bodies. It’s been 12 years since the Dharavi project was proposed, but it has not started, and the airport has still not rehabilitated displaced settlements. While Mumbai can take inspiration from various global waterfront revitalisation models, many criticise the government’s top-down method of planning. So far, the MPLDC has included public feedback in the afterword pages of its voluminous project proposal. Among the many points raised, stakeholders and urban initiative groups have vociferously discouraged space for offices, commercial and industrial use of the land. “No shopping malls should be allowed in the developed area,” said a comment. Adarkar said the plan lacks hospitals, schools, drama theatres, libraries and art spaces and other such social institutions with unrestricted public access. Globally, waterfronts reflect their city’s power struggles and realities. Redevelopment of the London Docklands pushed out native islanders and dock employees. In Sydney, Darling harbor (largely regarded as a success) has been criticised for being exempted from development controls and failing to integrate with Sydney’s existing fabric.